These days, movie trailers can stand alone as their own work of art. It gives us, in about two minutes or less, a glimpse of what's in store. Its soul purpose is to hook and reel us in enough to say: "I'd pay to see that." How many times have you seen a movie based on the trailer alone? Countless times, I'm sure. Trailers have become bigger and more grand in scale over the years, some are weak, while others are solid. So, what makes a good, solid trailer? A good trailer combines the perfect music, with superb, well-edited clips. It brings emotion out of us when least expected. And most of all they never give too much away. So, if you want your movie noticed it's imperative you have an eye-catching trailer - whether or not the movie is actually any good is irrelevant. This past year we've seen some extraordinary trailers, some of which might be/were even better than the movies themselves. 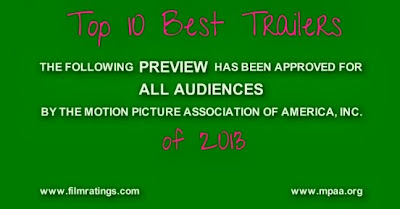 In no particular order I present the Top 10 Best Trailers of 2013. Another day, another remake. However, there is something hauntingly romantic and sinfully seductive about this trailer. It's edited to perfection. Young love, torn apart by parents and their fight to stay together, backed by the breathtaking "Addicted to Love" cover by Skylar Grey. It's all so beautiful. "Another kiss... is all you need..."
Here's an excellent example of an eye-popping, edge of your seat, gripping trailer. Even if you didn't like the movie you can't deny this trailers "awesomeness." Introducing the films enemy right away is brilliant. It's dark, full of action and yet it doesn't give too much away. An excellent trailer for an excellent superhero. If there's anything we take away from this trailer (and movie for that matter) it’s that nothing exceeds like excess. Using popular music is pretty common when cutting trailers now a days, and no trailer this year excelled more than adding Kanye West’s “Black Skinhead” to the chaotic, insane tone of the movie. Brilliant. Using new hit music is common practice when cutting trailers for upcoming films, but no trailer this year did it better than taking Kanye West’s “Black Skinhead” and applying it to the chaotic, insane tone of the picture. This trailer also gave us Leonardo DiCaprio popping-and-locking and then drops the music to let Matthew McConaughey do his crazy, hilarious chant. Usingnew hit music is common practice when cutting trailers for upcoming films, but no trailer this year did it better than taking Kanye West’s “Black Skinhead” and applying it to the chaotic, insane tone of the picture. This trailer also gave us Leonardo DiCaprio popping-and-locking and then drops the music to let Matthew McConaughey do his crazy, hilarious chant. Combine Tom Cruise with Call of Duty and Groundhogs Day and you get this movie. Combine Tom Cruise, Groundhogs Day and Call of Duty and what do we get... this movie. Sure, it may not be any good in the end, but this trailer is definitely powerful non the less. It's gripping and hypnotic in every way that counts. This is most definitely an interesting take on the biblical story of old. It looks epic, dark and dreary, yet filled with hope and love, not to mention it has an amazing cast. The beautiful musical score is hugely captivating as well. Here comes the 70's in all its glory, fashion, music and hair-dos... oh, and those hair-dos. Amazing. With an all-star cast, this trailer is eye catching, hilarious, mixed in with some intense drama. Sold! Don't tell the other trailers, but this dramatic trailer is my favorite. The slow building musical score reused from past films. The emotion it commands... bringing chills to your body no doubt. Even if the movie fails, which it could, but I seriously doubt it will, this powerful trailer most certainly does not. This was thee most terrifying movie of 2013, there's no doubt about it. A happy family moving into a new home. Kids fighting over rooms. Family game time... family game (sigh), oh dear. Never in all my life (so far) has a trailer alone made me scream. There's something quite beautiful about this trailer, even. Spike Jonze takes what should be "gross" and turns it into “sweet.” This trailer is exciting, heartfelt, emotional and incredibly intriguing. Even though this movie is predicable, there's something extremely charming about it. It is full of life, inspiration and hope. And if that isn't enough to reel you in then maybe Tom Hanks, Emma Thompson and Mary Poppins will. Supercalifragilisticexpialidocious. What are some of your favorite movie trailers of 2013? 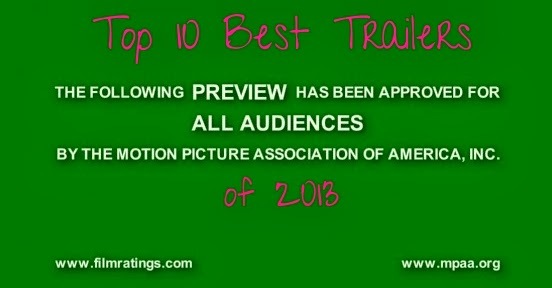 To view the Best Trailers of 2012 click here. This is the first time I've seen some of these previews. I loved Man of Steel. I am intrigued by Noah and the new X-Men movie.